Well, it’s finished. What have I learnt from this test of a design published in 1880? This design is quite sweet but I think a similar effect could be achieved more simply. The stitched on lace border is charming – see my previous post for instructions – BUT the seam around the leg is quite clumsy. Adding the ribbon threaded through the eyelet holes around the ankle made a nice finishing touch. As I mentioned previously the writer of this pattern decided not to give the instructions for the lace at the cuff of the sock as illustrated. So I started this edging wondering what the finished trim would look like and I must say I like it a lot. It redeams the writer in my eyes for the clumsy construction of the sock. In my next post I’ll show the completed sock but just for now let’s look closer at the lace edging. Don’t you think it’s a lovely little edging design? I liked it so much I decided to try it out in a couple of other yarns. ply. I knit it on 3.75mm needles for a more open airy texture. I think it would make a lovely edging for a lace shawl, or maybe the cuff of a cardigan? For a completely different effect I tried it in Anchor Alida 6 ply crotchet cotton using 2mm needles. I think this might look good as the edging of a tray cloth or on a white pillow case if you like the vintage look. None of these examples have been washed and blocked yet. If you would like to try this edging this is the pattern. I’ve rewritten it to make it a bit easier to follow. Cast on 9 stitches. Knit one row. 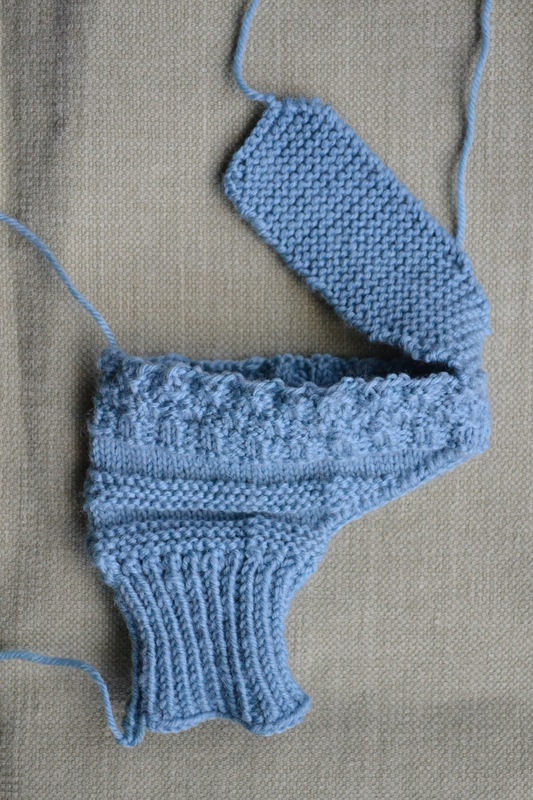 ** the method for M1 is to knit first into back of the stitch and then knit into front – 2 stitches on needle. The second of these is the first of the K3. *** Cast off 2 stitches. 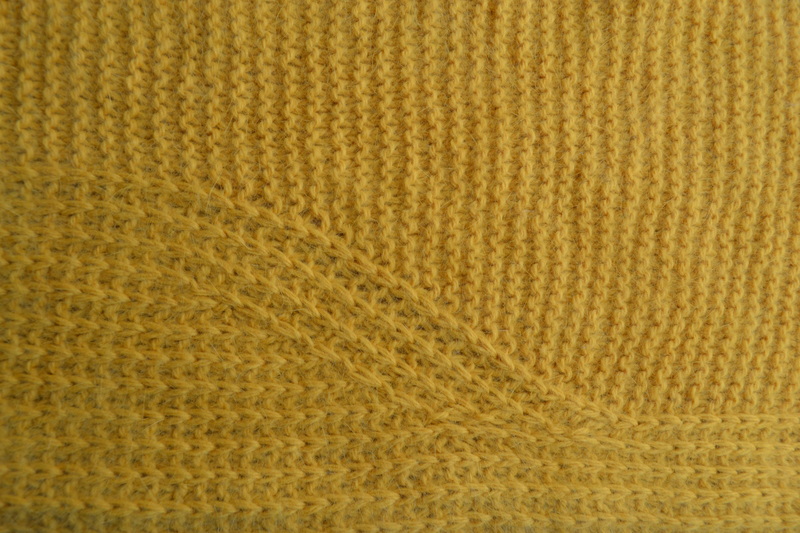 The extra stitch at the start of Row 2 and the cast offs at the start of Row 4 form the zig-zag edge. Well, I’m coming to the conclusion that the writer of this design could have made it a lot simpler, and better. After knitting the foot and ankle section in the round the writer has us cast off. 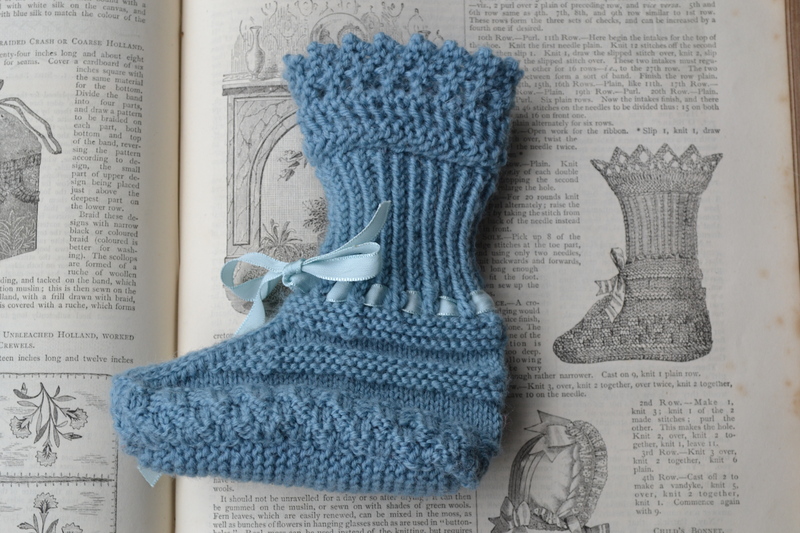 The foot sole is then knit as a flap attached at the toe as shown here. 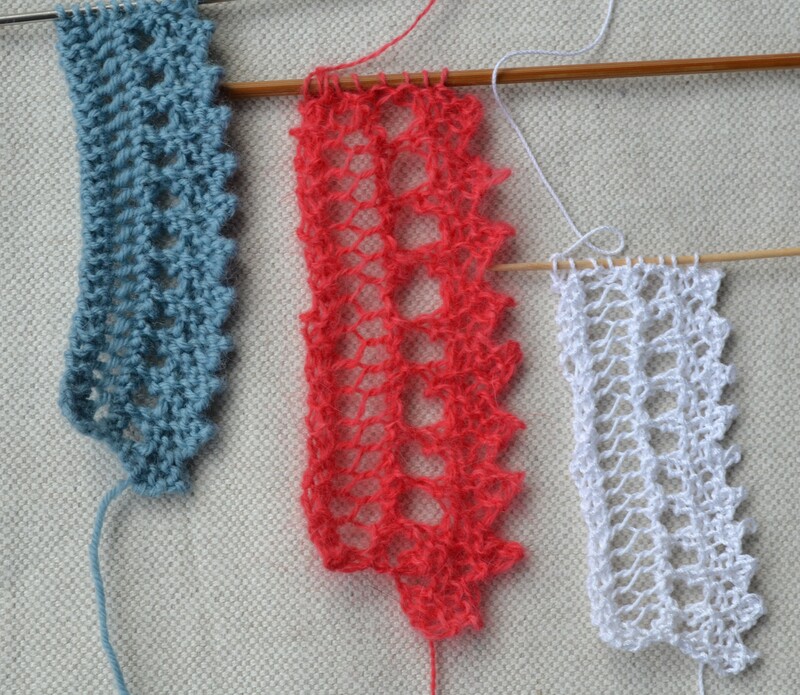 The next steps are to knit a separate lace border and sew it to the cast off top, and to sew the sole piece in place. So there is quite a bit of seaming in this tiny object! As I have knit it I have concluded that it would be possible to knit the sole first and then pick up stitches around the circumference for the foot. A nice little knitted frill could be grown on from the top of the ribbed section without the need for a seam. However I’ll continue as instructed for the genuine experience of making this sock as designed in 1880. However I’m planning a new design inspired by this sock with modifications to make it easier. The baby’s sock is coming along. The sock is knit in the round and starts from to bottom but leaving the sole to be added later. The pattern is less clearly written than today’s and I had to pull back a bit when I missed the start of the garter stitch band. My sample is knit in coarser wool than the original was intended to be and the needles are a tad finer than they could be for this yarn so the sock is possibly more like a slipper than a sock. From the side the sock looks very like the illustration. But the illustration doesn’t show the very nice little band that the shapings on the top of the foot forms. There is a central band of two knit stitched with a slip one, knit one , pass slip stitch over on each side. If I were to make this sock for real I would make a left leaning decrease on the right side and a right leaning one on the other to balance them. 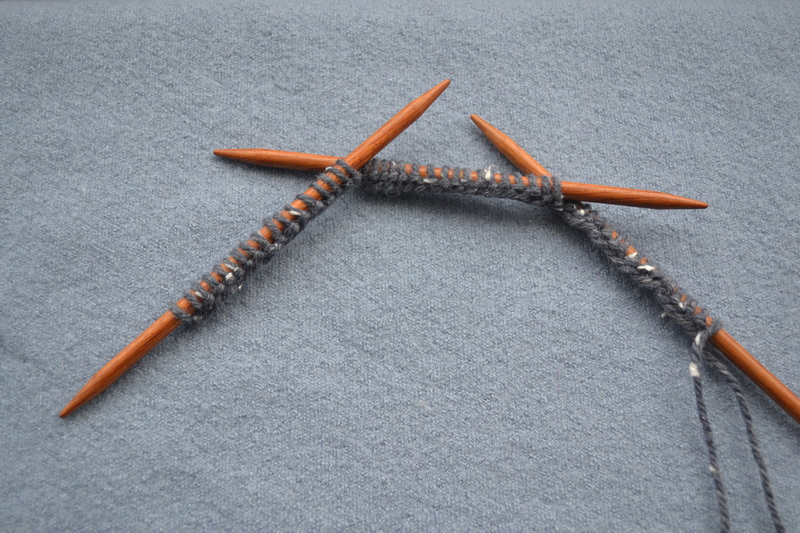 If you have never knit on double-pointed needles (dpns in knitting jargon) don’t be put off at the start. The first few rows are the most awkward to deal with but once there is a bit of fabric formed it gets a lot easier. I enjoy knitting on dpns but I definitely don’t want to have to knit those first few rows more than once. So take a few moments after casting on to check that you don’t twist the work when you bring the two ends together to start knitting. 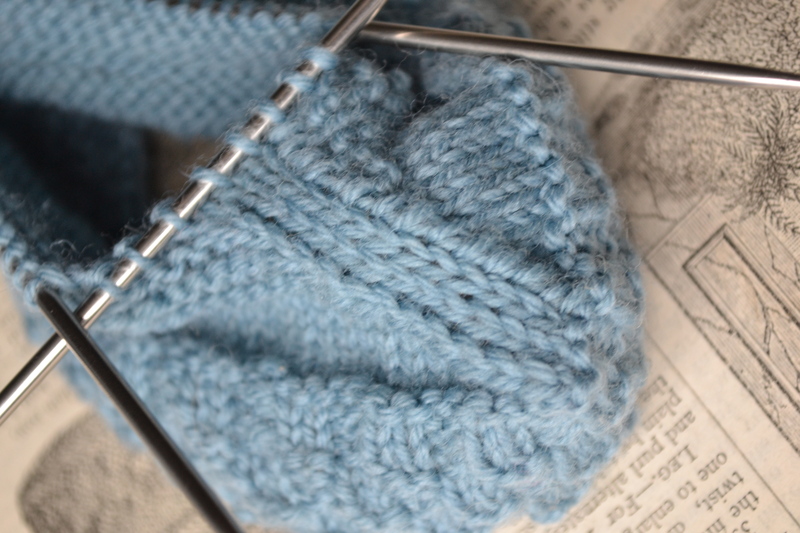 Line the needles with the stitches distributed as specified in your pattern. Make sure the ridge that will form the edge of the work follows from one needle to the next is lined up from one needle to the next without a twist. If you do have a twist in the work you might not realise it for a number of rows – but once you do there is no alternative but to rip the work back and start again. 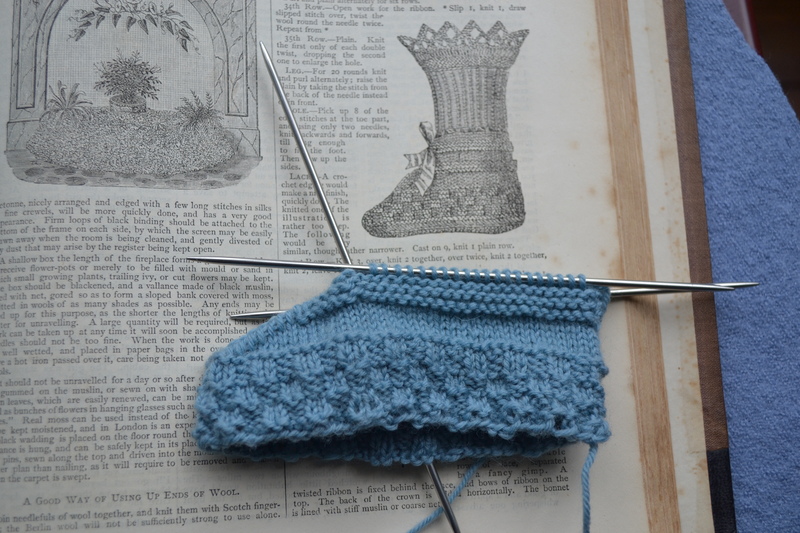 For my first Knitting from History feature I am attempting to re-create a sock from The Girls Own Paper from 1880. The sock is knit in the round. I am using Rowan 4ply wool and 2.75mm needles which seems to be about the right for a reasonably close fabric. This is a experiment and not intended for to any tiny recipient to wear. My main interest is to explore how the pattern works and how the way it is written differs from today’s patterns. I’m also intrigued by the idea of following instructions that might have been followed by the original owner of my copy of the magazine over 130 years ago. But I’m jumping ahead. First to cast on 80 stitches and after a foundation row start to work the checked band around the base of the foot. I’ll keep you updated as the project progresses. 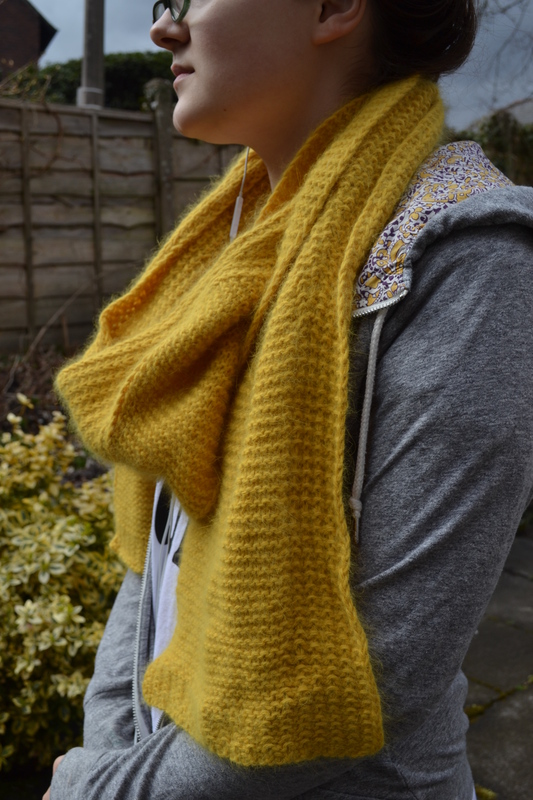 Learning to knit – or what happened to the lap-bag? My first knitting memory is from when I was about six or seven. I was in bed with a sore throat knitting a piece of stocking stitch – maybe a scarf or blanket for a doll. I could do knit stitches but not purl. My mother came into the room every so often and sat on the bed to do the purl rows for me. Later we did knitting in my Scottish primary school. One afternoon a week the boys went off to do something mysterious with wood and nails while we girls did sewing and knitting. After the first rudimentary sewing trials – cross stitch on strange fabric with holes in it – our first important project was making a ‘lap-bag’. This useful item was basically an apron with a deep full-width pocket. Mine was cream. The teacher had a half a dozen dark brown shiny card templates and we were all able to choose one as a motif to embroider on the pocket. She traced round the template onto the fabric and we sewed running stitch in one colour of stranded cotton and then laced another colour through it to make a solid outline. Mine was a rabbit. Once we had a lap-bag we could do knitting. Knitting lessons started with us tying on our lap-bags. Our ball of wool remained in the pocket while we knit. When the lesson ended the knitting on the needles was stowed away and the lap-bag rolled up with our work safe inside, and tied into a bundle with the waist ties, ready for the next week. The first school project I knit was a pan holder from two contrasting squares of DK garter stitch sewn together with blanket stitch. Mine was red and green. My mother was unimpressed when I gave it to her. ‘Red and green should not be seen, except upon an Irish Queen’ she said. I don’t know how we got from pan-holders to socks, but we did. 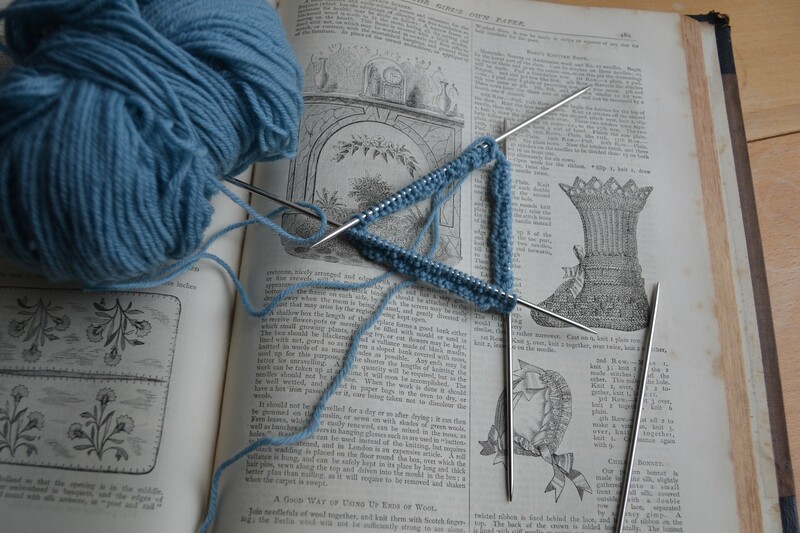 A later memory is of knitting socks in 4 ply on 4 needles. We had a choice of grey or fawn wool. When we finished the cuff the teacher sat at the front of the class and read the instructions out and we simultaneously turned the heel. I don’t remember what we did about the toes. Perhaps the teacher grafted them for us. I do remember they were gathered in at the end because when we came to claim them my pair, in fawn, was missing and a grey pair was left on the table. Classes were big in those days – there were 42 in the whole class so there must have been about 20 girls so I expect finding the right home for 20 grey or fawn pairs of socks was always going to be a bit hit and miss. I was miffed though. The lap-bag was an important piece of kit for us girls. I often think, as I retrieve my yarn from under my chair, how useful it was. Mine has been lost in the intervening years. I think of it fondly from time to time. Q. Do you remember learning to knit? And does anyone use a lap bag any more?